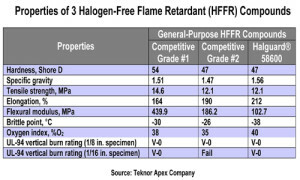 SINGAPORE, September 15, 2014: A new series in the Halguard® range of halogen-free, flame retardant (HFFR) compounds for general-purpose jacketing applications costs less than premium compounds with little compromise in performance properties, it was announced today by Teknor Apex Company, which will introduce the products at Wire China 2014 (Booth W1-C23). 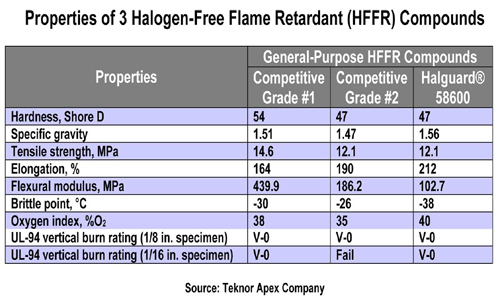 Teknor Apex recommends Halguard 58600 Series compounds for cable used in subway, mass transit, cell tower, and other infrastructure applications as well as internal wiring in electrical and electronic equipment. About Teknor Apex. Teknor Apex Company, a privately held firm founded in 1924, is one of the world’s leading custom compounders of plastics. Teknor Apex produces flexible and rigid vinyl, thermoplastic elastomers, nylons, toll and specialty compounds, color masterbatches, specialty chemicals, bioplastics and hoses. The company is headquartered in Pawtucket, RI, U.S.A. and operates thirteen facilities worldwide in the United States, the Netherlands, the United Kingdom, China and Singapore. Teknor Apex Asia Pacific Pte Ltd. is headquartered at 41 Shipyard Road, Singapore 628134. Tel: +65-6265-2544. Fax: +65-6265-1821. Email: [email protected] Teknor Apex Asia Pacific operates manufacturing and development centers in Singapore and Suzhou, China with commercial and technical offices throughout the Asia Pacific region.